Imagine yourself waking up in the middle of a dark night. You exit your house and begin wandering around a dimly-lit forest. You cannot see the path ahead, nor do you know exactly where your destination is. The only guidance you have on this daunting journey is the voice of your Beloved saying to you: “I’ll meet you underneath our favourite tree.” Though you bear no compass or map, that sweet voice inside your heart urges you on in the hopes that you might find the place of the Beloved. Some of you may find this imagery familiar. It is taken from the poem The Dark Night of the Soul by St John of the Cross, which itself is based on a passage from the Song of Solomon. The phrase the dark night has become so popular even our secular friends use it. 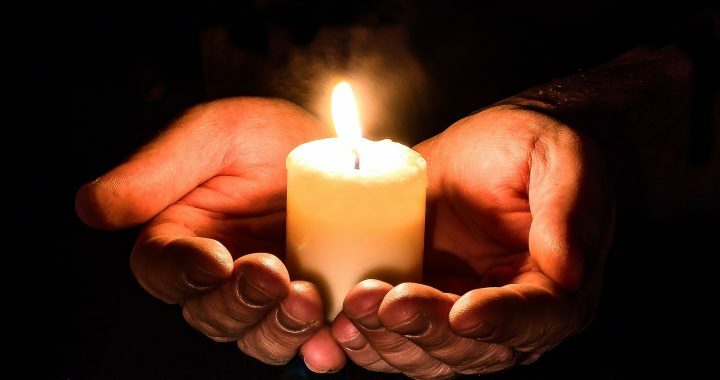 But as Catholics, to gain a fuller knowledge of the workings of the interior life, we must come to understand how exactly these dark patches in our prayer life work, how they come about and how we should respond when faced with these prayers. A friend of mine once said that we cannot hold both sin and grace in each hand. The weight of both is simply too immense, and we will eventually must either renounce sin or renounce grace. Sometimes, we become so deeply rooted in our sin that our eyes simply become obscured and incapable of seeing God. This is one of the big reasons why people in the modern age claim that they cannot “feel” God, because they live in a lifestyle so deeply contaminated by sin that they are unable to receive the grace of experiencing God. The Catechism of the Catholic Church (CCC) describes one of the big obstacles in the prayer life as acedia, namely “lax ascetical practice, decreasing vigilance, carelessness of the heart” (CCC 2733). Acedia, interestingly, is translated into our modern language as sloth. 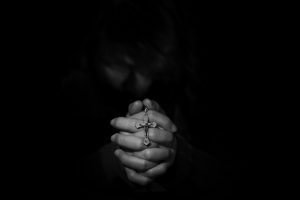 For many Catholics, although we more or less live in a life of grace, trying our best to avoid sin and receiving the sacraments when we fall, a bigger challenge is to maintain the life of prayer. 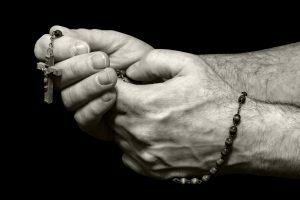 We feel lazy to complete the Rosary (I, myself, am incredibly guilty of this), cannot wake up in time for morning prayer, and, in the rush of the day, are too tired to pray at night. 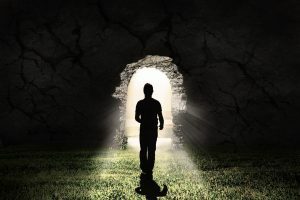 Since prayer is, as St. Therese of Lisieux says, “a simple turn toward heaven”, not praying consistently inevitably leads one to look away from the glory of heaven and to instead begin to wander around in the dark. Surprised? This is where the true dark night as St John describes, begins. For those Catholics who have lived a (more or less) sin-free life and who are deeply immersed in the school of prayer, there may come a time when God wants to lead us into deeper relationship with Him. Instead of a faith dependent on seeking the consolations of God, He wants our faith to grow into one dependent on the God of consolations. So sometimes God will purposefully take away the feelings of victory and fulfilment in prayer. In that dryness, He allows the soul to wander around a bit before finally, slowly, surrendering to Him. Mother Teresa describes this as “such convicting emptiness that those very thoughts (i.e. that God has abandoned her) return like sharp knives and hurt my very soul”. And yet, a look at her life shows that such times of darkness purified her soul and made her into a strong woman and a witness to the love of Jesus Christ. Indeed, one of my closest spiritual mentors once confided in me that, once his dark night ended, the soul emerges stronger and more faithful to God. No man was made to journey through life alone, and the same is even more urgently true in periods of desolation. In those dry periods, our souls are incredibly vulnerable to discouragement and attacks from the world and the evil one. We need our brothers and sisters to help us walk through the dark days and remind us of the goodness and mercy of the Lord. 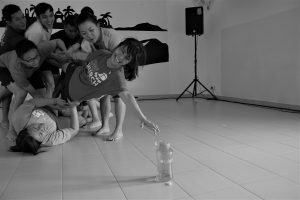 Community helps us to bind up the lies that may come – lies that try to convince us that God has abandoned us, that He does not love us, or that He is punishing us. Community convicts us in the truth that God is still with us, that He does call us Beloved. and that He wants to shower us with grace. And finally, community prays for us and helps us guard our souls from external forces that seek to tear our eyes away from the path to holiness. As an offshoot of that, finding a spiritual director, someone in a position of spiritual authority, such as a priest, nun, or other authority figure, can help us. Spiritual directors can look at our lives from an objective and external view and guide us along the right way back to Christ. St Josemaria once said of the Rosary, one of the most powerful and effective forms of contemplative prayer: “Blessed be that monotony of Hail Mary’s which purifies the monotony of your sin!” While our prayer life in these dry times can become particularly difficult, there is abundant grace to be found in staying true to one’s devotions and remaining faithful to one’s prayer life. It’s like an athlete who trains on days when he feels the least like training. On those days, the gains he makes in training are far greater than on a normal day, because not only is he developing his physical fitness, but his mental grit as well. In the same way, contemplative prayer in the dry periods can work wonders in improving our discipline and building up our faith. For me, personally, I find reciting the Divine Office to be most fruitful as it allows me to build my schedule around specific times. However, different people have different preferences and I encourage you to find what works best. I’d like to share one of the most hopeful Bible verses I have ever come across: “For I know that my Redeemer lives, and that at the last he will stand upon the earth.” It may come as a surprise that this passage comes neither from an exhortation by Paul nor a hopeful prophecy by Isaiah. It comes from Job 19 (v. 25), one of the darkest chapters in one of the darkest books of the Bible. The book begins with Job, a righteous man, losing everything – from his family to his possessions, and even his health withers away. This very chapter begins with Job lashing out at his friends: “How long will you torment me and crush me with words?” (v. 1) And yet, somehow, amidst all that pain, Job found hope inside himself, a hope that led him to prophesy about the coming of the Redeemer. Did he break down and lose control of his emotions? Of course. He was human after all. Yet, at the end of the book, God reveals to him the entire cosmos and the sheer detail that went into creating and maintaining the universe (Job 38-39). The lesson for Job was that God’s plans are far beyond his understanding. In the same way, the best way forward in times of darkness is simply to remain hopeful and to be patient with God, who sends us these periods of dryness for good reasons. We must cling on to the truth that all things will work out for those who trust in the Lord (Romans 8:28), and we must remember that Christ is risen, that He has already conquered death for us, so nothing on this earth can disturb us again. In the end, spiritual desolation and the experience of dryness and darkness in our prayer life are simply part and parcel of our faith journey. I myself struggle with those periods. But instead of panicking and losing out trust in God, let us calm down and claim, as our truth, the words of St. Peter, that: “… after you have suffered for a little while, the God of all grace, who has called you to his eternal glory in Christ, will himself restore, support, strengthen, and establish you” (1 Peter 5:10). 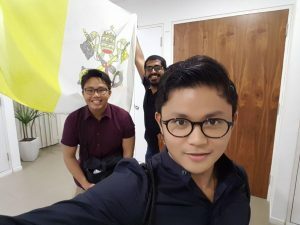 About the author: Hello, I’m Joseph, a member of Ubi Caritas, the Catholic Community of Yale-NUS. Though I like to participate in long-distance runs, the only race that matters for me is the one “… to receive an imperishable crown” (1 Corinthians 9:25). Be edified in your faith. Like us on Facebook and follow us on Instagram.